Thinking of organizing a conference or other event? Eindhoven University of Technology has several unique areas for this purpose, in the Auditorium and De Zwarte Doos. For information please contact conferences. 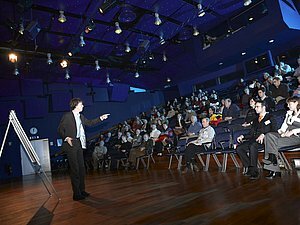 The Auditorium has 16 lecture rooms varying in size along with the Blauwe Zaal, the Senaatszaal, the Voorhof, the Congresbalie and reception rooms. The opening hours of the Auditorium building are Monday to Thursday from 7.30 till 22.00 and on Friday from 7.30 till 20.00. De Zwarte Doos has three meeting rooms, a film theater with a lounge and Grand Café. The opening hours of De Zwarte Doos are Monday to Thursday from 7.30 till 22.00 and on Friday from 7.30 till 20.00. For catering options you can contact De Zwarte Doos by phone (040-2475566) or by e-mail.